Realistic plastic yellow traffic signs warning of dinosaur traffic up ahead. Perfect for the bedroom door of a young dinomaniac. Small hole for mounting or light enough to be held with an adhesive. 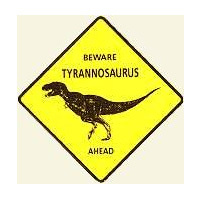 Like the other dinosaur road signs, this is a 15 1/2″ x 15 1/2″ road sign. Lightweight but strong, it’s constructed of .030 thick high-impact stryene. Tags: bedroom, road, sign, stryene.